DNHOST Review 2019: Is DNHOST a Good Hosting? For over 18 years, DNHOST has been steadily growing in the web hosting space to become one of the most preferred vendors in Greece today. This vendor might not be the cheapest in Greece, but their continued growth in this space shows that many users don’t mind paying a little more for quality hosting services. DNHOST is one of the most preferred web hosting companies in Greece. They’re also one of the oldest, having been established back in the year 2000. Today, the company continues to grow their team of experienced and enthusiastic web hosting professionals who are passionate about delivering quality services to individuals and businesses in Greece. The DNHOST website is only available in Greek. Unfortunately, SSL certificates are not included as part of their hosting packages; these, along with dedicated IP addresses, must be purchased separately. LiteSpeed Web Server and CloudLinux OS – This combination affords Linux-based shared hosting accounts the fastest possible website loading speeds and best security measures in the market. PHP websites load up to seven times faster, and your account’s resources will be protected and have a huge buffer against traffic spikes that could bring down performance. Security measures including DDoS attack mitigation – DNHOST uses triple perimeter protection that shields the websites they host from attacks by hackers, bots, web spam, and malware. 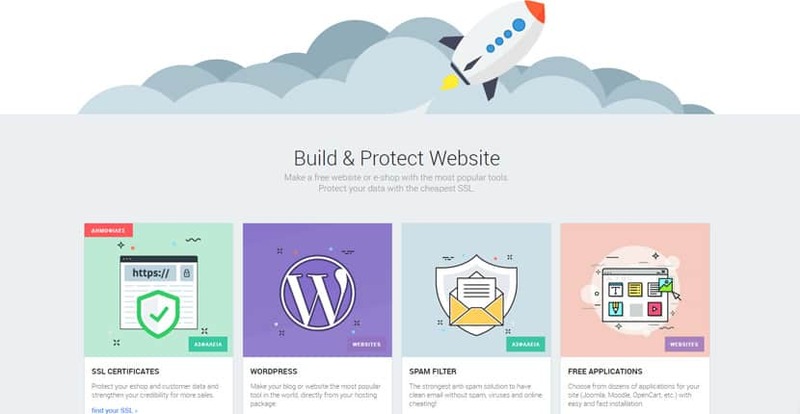 Website builder – This comes packaged with all shared hosting plans and affords you over 500 templates with which to quickly launch your website. Compared to other web hosting companies in Greece, DNHOST is relatively expensive. Their pricing might be influenced by the 18+ years of research and experience the company has accumulated as well as the sizable customer base subscribed to their hosting services. This vendor might not be the cheapest web hosting provider in Greece, but their continued growth in this space shows that many users don’t mind paying a little more for quality hosting services. DNHOST has a pretty straightforward upgrading and downgrading process as well, although if you’re upgrading to VPS, reseller, or dedicated server packages from a current shared hosting plan, this process will require you to transfer your website to another server and change your IP address. In addition to a very user-friendly website, DNHOST has a resourceful, fast, and polite technical support team available 24/7. You can contact the support team via their live chat, contact form, telephone, email, or social media channels. DNHOST has a pretty comprehensive knowledge base that serves as the first line of support for their customers. The vendor has no ticketing system. onClick="trackClickout('event', 'clickout', 'Vendor Page - Visit User Reviews', 'DNHOST', this, true);"
Άπλα και πολύ καλά, με κόστος που αξίζει! Επιτελούς κάποιος που ενδιαφέρεται για τους πελάτες τους!. Το support είναι το καλύτερο που έχω μέχρι τώρα και έτσι, δεν αλλάζω. Το site μου είναι πάντα online, χωρίς καθυστερήσεις. Το Spam Experts που προσφέρουν δωρεάν έχει λύσει το θέμα spam!. Ευχαριστώ παιδιά! From high-quality SSD-powered servers to all the latest software available, DNHOST has invested heavily in the provision of solid web hosting services for individuals and businesses in Greece. Wondering how DNHOST stacks up against other Web Hosting companies? Enter any other Web Hosting company and we will give you a side-by-side comparison.